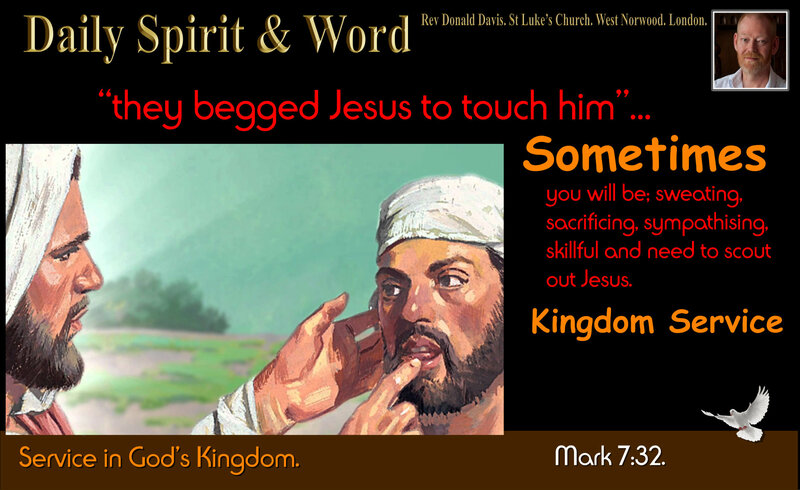 Daily Spirit & Word: 817: Longing to be at the FEET of Jesus. Good morning my friends, last night’s Christmas Feast Carols Rehearsal was wonderful. Although I was tired, with puffy eyes, those voices and the songs lifted my spirit and encouraged me to worship the LORD again. I was reminded this morning of something I shared yesterday about Mary and Martha, so decided to look at these sisters in the Bible. Do you know that every time Mary is mentioned, she’s at the feet of Jesus. It’s so important that we keep our daily time with Him. Just being in the LORD’s presence for a while each day, will transform your life. Martha is the practical one. That little family at Bethany was very dear to our Lord Jesus, he loved Mary, Martha and their brother Lazarus (John 11:1-5). 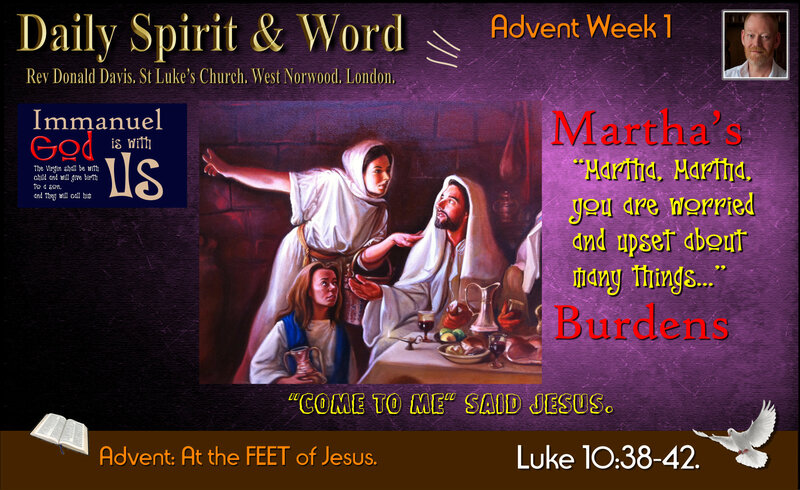 We are given three wonderful insights into Mary, Martha, and Lazarus (Luke 10:38-42; John 11; John 12:1-11). Each time you’ll find Mary in the same place: AT JESUS FEET. Martha, however, is the practical one, always ready to serve the Lord. But, when she complained to the Lord about her sister, she was told in no uncertain terms, that Mary had chosen what was best, to be at Jesus’ feet listening and learning. It wasn’t wrong for Martha to prepare a meal, everybody has to eat sometimes; but it was wrong for her to be so preoccupied with it, that she began to criticise someone else for not working with her, she should have just got on with the work she felt she had to do. However, we’re given an insight into Martha too, her labour had become a “burden”, but the LORD had even more insight than that, he revealed she was “Burdened by many things”: Perhaps that Mary was not helping Martha was just the straw-that-broke-the-camel’s-back, she snapped at Mary. It is annoying when we’re doing stuff and everybody else is just sitting around chatting and not bothering to help. However, we always need to be asking ourselves, “Why am I doing this?” If it’s to serve the LORD from right motives, what anyone else is doing won’t even bother us. I’ve noticed that too, sometimes people will explode at something that seems insignificant, but that little things is just the tip of the iceberg of burdens, and they can’t take any-more. Sometimes, when someone we know and love explodes like that, we need to button-it, give them a hug and some encouragement. They are often BURDENED by many more things than the thing they’ve erupted over. Jesus knew that Martha was “anxious and troubled by MANY things” as she tried to serve the Lord. When we’re serving Jesus, it seems that SATAN loves it when TROUBLES come and tries to cause even more division and troubles. Had it not been for the LORD’S intervention that day, perhaps Mary and Martha could have had a big fall-out and not talked to each other for a long time. I’ve seen families like that, falling out over something so small, but PRIDE gets hurt and families get divided. Whilst Martha was pre-occupied, Mary was focused: She was focused and fascinated by and with Jesus. I’ve no doubt that Mary longed to serve the LORD too, and she did. However, Martha was preoccupied and that clouded her vision. What we do with Christ is far more important than what we do for Christ, because when we are in submission, at the feet of Jesus, listening and learning from the Master, this will lead us towards even greater obedience and service. We can check our heart today: Am I ready to be with Jesus, to sit at His feet and worship, learn and obey Him? We can check our heart today: Am I serving the LORD? really serving Him? or has my service turned into something else? We can check our heart today: Am I pre-occupied and burdened by many things? Let’s before we explode at someone else, get those burdens lifted from off our shoulders by Jesus. COME LIKE MARY: To the FEET of Jesus. 27 “All things have been committed to me by my Father. No-one knows the Son except the Father, and no-one knows the Father except the Son and those to whom the Son chooses to reveal him. If you are weary and burdened or upset about many things like Martha, then come like Mary and sit at the feet of Jesus for a while. You’ll discover those burdens have been lifted from off your shoulders. Praise the LORD! Let’s come to Jesus afresh before the Weekend is upon us. Let’s come to Jesus and unload our burdens. Let’s come to Jesus and receive His easy yoke and light burden. Amen! Daily Spirit & Word: 816: Maintaining The LINKS of LOVE. Hearing the WORD and Doing the Word. Internal Spiritual Development (Spiritual Growth) = (POWER). Intimacy with God the Father, through the Son, in the Spirit. External Practical / Ministry Development = (IMPACT). Obediently Serving the Lord in the POWER of the Holy Spirit. (True Discipleship is always BOTH: Hearing and Doing: Power and Impact. Comes from Intimacy and Service). God wants you to be Spiritually Fruitful. Good morning my friends, How’s your GOOD WORKS going? I was challenged the other day by a Bible verse about not just knowing Jesus and learning all about His commands and teachings, but putting them into practice in my daily life. You see I love nothing more than getting into deep Bible study, but actually going out and serving and being humble and gentle and loving and kind in the world, that’s difficult bit. But I’ve also come to realise that if I’m not doing what I’m learning, then I’ll lack the impact in this world for Jesus. The Wise and Foolish Builders: Hearing & Doing God’s Word. The Apostle James said something similar to His Lord Jesus Christ, James 1:19-27. Perhaps after years of being a Disciple of the LORD he’d learned the hard way to put into practice the teachings of Jesus. (See James quote at bottom of page). And one of the most common Christian discipleship problems today is related to the splitting-up of these two areas of development: Spiritual Growth and Ministry Growth. Many churches are very good at hear-the-word discipleship, which they quite rightly consider to be very important, but they neglect the kind of do-the-word discipleship that God intends to flow from or follow on from our hearing the Word, E.G. They might consider feeding the hungry, visiting the prisoners or sheltering the homeless to be less important than one’s fellowship group, discipleship class, church attendance, or prayer life and personal daily devotions. What happens when we do this? When all we focus on is internal spiritual development but we fail to do external ministry? The results will be that We lack impact. Christ wants us to impact the world for Jesus and His Kingdom, because He wants His Kingdom to grow, but when we separate (BREAK THE LINK) both the hearing and the doing of the Word, we can’t make the IMPACT Jesus wants for us. We can’t just swing the other way, either. If all we focus on is external ministry and forget about our spiritual development, we are going to lack the power of Heaven. To get that POWER we need to maintain intimacy with Jesus first. I’ve seen that happen to very sincere Christian organisations; they start out with a Word from the Lord to help the poor or those in need, but very soon forget all about the spiritual aspects. Prayer, Bible reading and devotion get pushed out because of busy activity, and the focus shifts almost entirely upon serving others. They soon lack the Spiritual POWER and the desire to save souls for Jesus Kingdom. In fact they begin to look down upon those who are engaged in evangelism and the sharing the Word of God, believing that ministry and service is much more important. It gets to be like sticking a plaster over a festering wound and the rot soon sets in. So it’s always got to be both: Hearing and Doing. Learning from Jesus and putting what we’re learning it into practice. Hearing and Doing the WORD of God is like Joined-Up Discipleship. This HEARING & DOING: It’s all summed up in Jesus’ teaching of the Pharisees when they came to test Him. LOVE God and LOVE Neighbour. (The Greatest Commandment). Matthew 7:15-23. We show that we love God by HEARING His Word (POWER). We show that we love our Neighbours by DOING His Word (IMPACT). When we’re close to Jesus, learning His teachings, and being submitted enough to actually put those teachings into practice, we’re going to get closer to our neighbours as well, because we’ll want to be doing the good that Jesus has been teaching us. But there’s more: Praise the LORD: When we put what we know into practice, we’re going to get an even greater insight into all the good things that we have in our relationship with Jesus. Can you see the LINK? In Philemon we see the link so clearly, Paul heard about Philemon’s love and faith in the Lord Jesus, and it was evident, he made an IMPACT by his love for all the saints (his brothers and sisters in Christ Jesus). Jesus said, “It’s by your love for one another that people will know you are my disciples”… There’s the LINK: Hearing and Doing… Spiritual Development & Ministry Development. May you experience Jesus promises of blessings today, that no matter what STORM may come against your HOUSE, (wind and rain: Trials, Temptations, Troubles and Tribulations) you’ll be able to STAND. Because you are being obedient to what you’ve learned in Jesus presence, and you are putting it into practice in your daily life. Amen! Maintain the LINK between: Hearing & Doing. 20 for man’s anger does not bring about the righteous life that God desires. 21 Therefore, get rid of all moral filth and the evil that is so prevalent, and humbly accept the word planted in you, which can save you. 25 But the man who looks intently into the perfect law that gives freedom, and continues to do this, not forgetting what he has heard, but doing it—he will be blessed in what he does. 26 If anyone considers himself religious and yet does not keep a tight rein on his tongue, he deceives himself and his religion is worthless. Is James also talking about bearing fruits? “By their fruits you will recognise false converts” “False professors of faith”… Matthew 7:15-23. (True and False Converts). Which one was doing the right thing? Answer = BOTH of them, so don’t look down on the Mary or the Martha. Jesus is saying to me, “BE a Mary and a Martha”: Hear the WORD of The LORD and SERVE The LORD by Practical Ministry of Serving Others. The LORD said, “Mary has chosen what is best”… i.e. Getting close to Jesus and listening to his every word. That’s getting the POWER… However, Martha showed the servant’s heart, by opening up her home to Jesus and serving Him and the Disciples. That’s making an IMPACT. It’s got to be BOTH: inseparably linked, joined-up discipleship, hearing and doing. Amen! PRAYER: Oh Lord, I can see that the Christian Life that You have called me to has got to be balanced between being with You in worship, praise and adoration, in learning and knowing Your will, Your Commands, Your Teachings, then moving out into this world in Devoted and Committed Kingdom Service. Please Lord, give me the deep desire to learn and serve You with joy and gladness. Help me to Love You and Love others and always maintain those links. I know I need the POWER of Heaven in order to be able to SERVE You in this way, so please send the Holy Spirit afresh into my heart, mind and soul to give me the strength to serve You and build your Kingdom. Amen! Daily Spirit & Word: 781: Don’t Get Sidetracked. Over the summer we visited lot’s of historical sites, one was the Bluebell Railway. We took a trip on an old steam-train and it was awesome. So many childhood memories flooded back into my mind, things I thought I’d forgotten. Just the smell of the smoke evoked memories of the old railways in Edinburgh and day-trips to Kinghorn and Burnt Island in the 1960s and of course the Forth Railway Bridge. On the Bluebell line, trains would sit and wait on a sidetrack whilst another train passed, we observed the old fashioned way they changed the tracks by hand, pulling a lever. It got me to thinking about our relationship with Jesus, and how when something happens it is so easy to get sidetracked in our walk with Him. Getting sidetracked is so easy. As you begin a lifetime of following Jesus, it is important to understand that whatever you do for Him will only be a reflection of the relationship you have with Him. If you want to do great things just like Jesus’ Disciples and the Apostles, and I’m sure you do, then you need to have a great relationship with Jesus like they did. If you want to have a ministry for Jesus that is strong, your relationship with Jesus must be strong. Getting back on track is just as easy: Jesus is only a prayer away. After Pentecost, full of the Holy Spirit, the Apostles maintained a daily routine of prayer. They were keeping close to Jesus by gathering for worship and prayer. Oswald Chambers was a man others recognized as being abandoned to God. He was a Scottish itinerant preacher and Bible college founder. In his early forties he died far away from home in Egypt of a ruptured appendix while ministering to the troops during WWI. His meditations on the Christian life collected in the daily devotional classic “My Utmost for His Highest” have enriched generations of Christians. He deeply understood the essential nature of maintaining a close relationship with Jesus. J.C.Ryle an Anglican Evangelical Bishop. Knew about Daily Prayer and wrote some of the most powerful books to keep you close to Jesus. I read through a portion of his works every single day whilst at Theological College. It was a tough time, because I had to read so much garbage from liberal theologians and ordained men who didn’t know Jesus personally, but this sound man of God kept me on track with my own walk with Jesus. Selwyn Hughes: Wrote “Everyday With Jesus”. I got into reading those little daily devotionals when I was a very young Christian in the 1980s, and I can testify they kept me going on track with Jesus. Every day I’d pick up my Bible and the little booklet and read, pray, praise the Lord. Soon I realised it’s much more than reading, but listening and talking with Jesus. How you serve Jesus is simply an overflow of your time with Jesus. So my friends, the main thing about Christianity is not the work we do, but the relationship we maintain with Jesus, and the character, power and zeal you’ll have is a by-product of that relationship. That is all God asks us to look after, and it is the one thing that is being continually besieged by all the things that will try and get us sidetracked. You’ll see, because it’s easy to justify not spending quality time with Jesus, but you’ll also see that not spending time with Him will be equally evident. The most important thing you will ever do as a Christian is: SPEND TIME WITH JESUS DAILY. It’s a KINGDOM PRINCIPLE, PRECEPT and PRACTICE. Your own responsibility in the Kingdom of Jesus Christ to maintain your own personal relationship with the KING. Why? Because nobody else can do it for you. The best question you can ask your brother or sister in Christ is this, “How’s your walk with Jesus?” or “Are you meeting with Jesus every day?” Nothing else really matters, because what we do for Jesus will be shown by how close we are to Him. I’ve met many Christians who’re struggling with basic things, I’ve counselled so many, but when we take a closer look at how they are spending time with Jesus daily, we’ve found that’s the one thing they’re not maintaining, so problems come. We’ll avoid so much heartache and troubles if we just keep closer to Jesus. He’ll warn us when things are coming our way. He knows the future. He knows the past. He knows everything. You have the privilege of coming to the sourse of the best NEWS you’ll ever hear every day. But more than that; Jesus wants to talk with you too. He’s waiting for you every day. When you get up and go to Jesus, He’s waiting for you. How’s your walk and time with Jesus going? Living for Jesus flows out of your relationship with Jesus. WARNING: We often get it the other way around. So often we Christians get so caught up in what we are trying to do for Jesus that we totally overlook the source of power for anything we can do for Jesus, which comes out of who we have become by spending time with Jesus. I’ve made the mistake so many times of forgetting Jesus. It’s as if we’re serving the LORD but forgetting to involve Him in what we’re doing. Never forget it is Jesus you are living for and serving. If you’ve ever been in a significant relationship, then you’ll know that the strength of your feelings of love, devotion, care and concern are dependent upon how close you feel towards that other person. So many times I’ve heard from couples, “We’ve just drifted apart emotionally”… It’s so true. We stop caring. We stop being concerned about them. We begin to live for ourselves. If that’s true in our earthly relationships, then it’s also true in our Spiritual relationship with Jesus Christ. You’ll notice over time that you just don’t care if you don’t spend time. A wake-up call is coming your way if you’re living your Christian life like that. So you’ll stake everything on maintaining the most important relationship you’ll ever have in life; the one with Jesus Christ. Fix A TIME that’s right for you: I do it first thing every morning. And so did many of the powerful men of God in the past, but I’m aware that might not be the best time for everyone. But FIX a TIME to be with Jesus every day. Don’t let anything push that time with Jesus out of the way. Treat it like an appointment with the Queen or President or Prime Minister. It’s your appointment with the KING of Kings. Pray, Read God’s Word, Pray, Praise, Sing, Pray, Listen, Meditate upon what you’ve just read; Pray in the Scriptures, Ask Jesus questions about what you’ve just read. Worship and sings songs based upon what you’ve just been reading in God’s Word. Use YouTube and Google to search out songs related to your Bible theme. (The JOY of the LORD is my strength). Read about the Saints who’ve gone before you and how they got on FIRE for Jesus, but more importantly, how they maintained that fire and stayed on-track with Jesus. Keep a prayer / devotional journal: Write things down. It’s amazing how Jesus brings you back to a prayer you’ve written and shows you how He’s answered it. As you spend time with Jesus you will be able to do so much for Jesus. 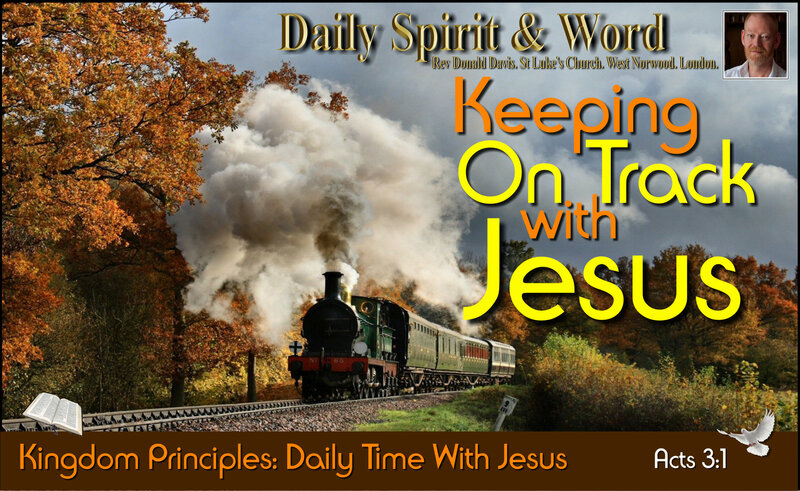 It’s amazing what you can learn from a trip on an old fashioned steam train, I’ll never forget my trip on the Bluebell Railway and what it taught me about staying on track with Jesus. Have an awesome week my friends. BTW: by-the-way, we’ve got our Monthly Prayer Meeting tonight at 7.30pm in St Luke’s Church: I’ll be sharing more about the MOST IMPORTANT THING in Christianity. Be blessed in Jesus. 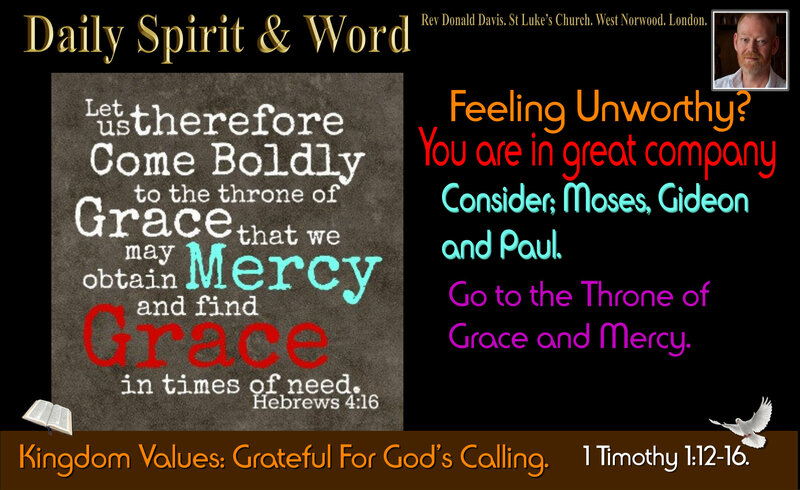 Daily Spirit & Word: 545: The Most Excellent Way. Spiritual Gifts: Discovering My S H A P E.
Good morning my friends. When you became a Christian (If you are a Christian), God gave you the great gifts of Salvation and the wonderful sure and certain HOPE of Eternity in Heaven in your heart. You became a member of God’s Family with brothers and sisters in Christ Jesus. He also gave you a deeper sense of purpose for life and made you feel significant (important to Him) in your life now. He has also given each one of us the opportunity to serve (Minister to) others and make a real difference in someone else’s life and in this world for Jesus. When you serve others in Jesus’ name, that’s called MINISTRY. God didn’t design ‘MINISTRY’ for just a few with THEOLOGICAL COLLEGE DEGREES. In St Luke’s Church and most mainline Evangelical, Charismatic, Baptist and Pentecostal Churches, we all believe that EVERY MEMBER of our church is a MINISTER, with a ministry for the LORD first, and secondly towards others. This Every Member Ministry is what today’s TEACHING is all about. 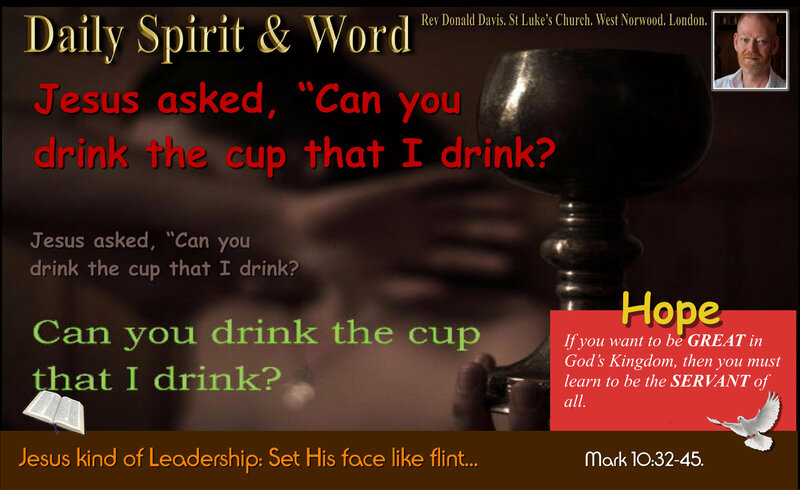 During this session of Spirit & Word, you will discover how God can use your; S. H. A. P. E. for His glory. S: SPIRITUAL GIFTS: Special Spiritual Gifts, to build up the body of Christ. A: ABILITIES: your Abilities: What unique abilities do you have that would enable you to serve Jesus and His body? E: EXPERIENCES: Experiences to minister to others in need. What you’ve been through in life. This is ALL ABOUT DISCOVERING YOUR S.H.A.P.E for the MINISTRY Christ has called and gifted you for. Why are we looking at this SHAPE stuff? Because as part of our VISION WEEK: Seeking the LORD for His Vision for St Luke’s Church: We discovered that He wants to enable us to continue what we’re doing here in St Luke’s, but to do what we are doing better. It’s a bit like going back to basics. We followed through with this idea and felt for everyone to be able to know how to SERVE Jesus better, we first needed to know what our GIFTS from the Holy Spirit were. But it’s not just about SPIRITUAL gifts; because each individual has a unique role to play in the family of God. We’re all made up in different ways and the LORD uses that fact to get a much more rounded ministry. We felt every member should know themselves better, in order to be able to serve the LORD. But there will be ample opportunity to discover the rest as well. 1 Now about spiritual gifts, brothers, I do not want you to be ignorant. 2 You know that when you were pagans, somehow or other you were influenced and led astray to mute idols. 3 Therefore I tell you that no-one who is speaking by the Spirit of God says, “Jesus be cursed,” and no-one can say, “Jesus is Lord,” except by the Holy Spirit. 4 There are different kinds of gifts, but the same Spirit. 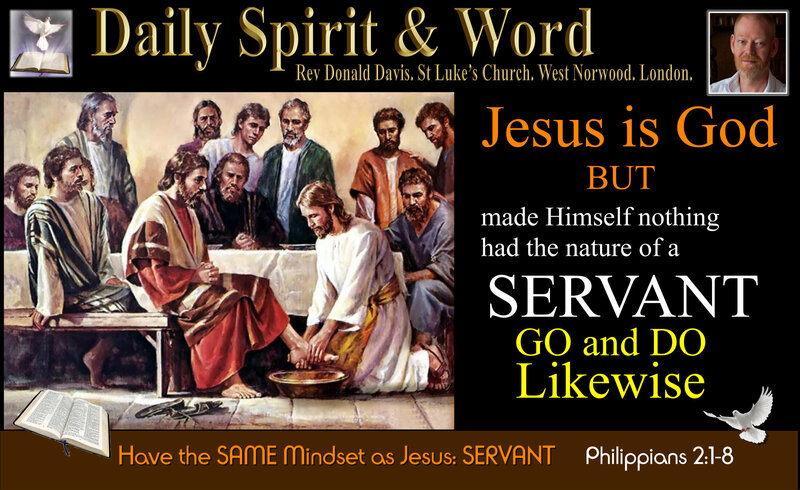 5 There are different kinds of service, but the same Lord. 6 There are different kinds of working, but the same God works all of them in all men. 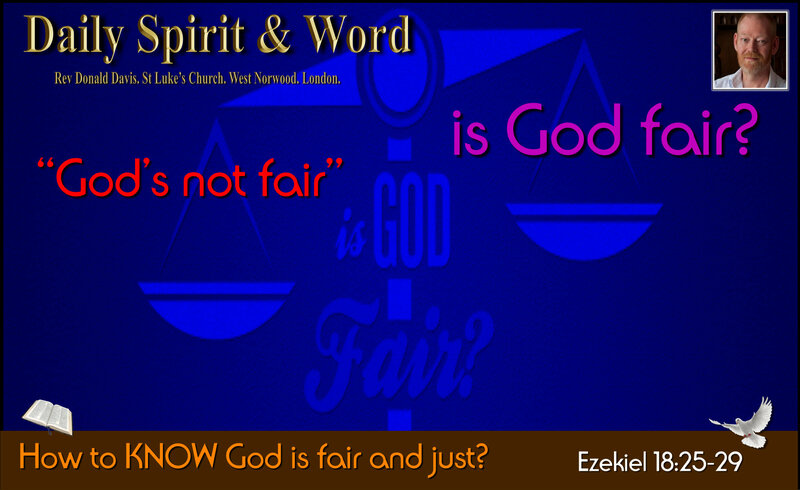 7 Now to each one the manifestation of the Spirit is given for the common good. 8 To one there is given through the Spirit the message of wisdom, to another the message of knowledge by means of the same Spirit, 9 to another faith by the same Spirit, to another gifts of healing by that one Spirit, 10 to another miraculous powers, to another prophecy, to another distinguishing between spirits, to another speaking in different kinds of tongues, and to still another the interpretation of tongues. 11 All these are the work of one and the same Spirit, and he gives them to each one, just as he determines. 12 The body is a unit, though it is made up of many parts; and though all its parts are many, they form one body. So it is with Christ. 13 For we were all baptised by one Spirit into one body—whether Jews or Greeks, slave or free—and we were all given the one Spirit to drink. 14 Now the body is not made up of one part but of many. 15 If the foot should say, “Because I am not a hand, I do not belong to the body,” it would not for that reason cease to be part of the body. 16 And if the ear should say, “Because I am not an eye, I do not belong to the body,” it would not for that reason cease to be part of the body. 17 If the whole body were an eye, where would the sense of hearing be? If the whole body were an ear, where would the sense of smell be? 18 But in fact God has arranged the parts in the body, every one of them, just as he wanted them to be. 19 If they were all one part, where would the body be? 20 As it is, there are many parts, but one body. 21 The eye cannot say to the hand, “I don’t need you!” And the head cannot say to the feet, “I don’t need you!” 22 On the contrary, those parts of the body that seem to be weaker are indispensable, 23 and the parts that we think are less honourable we treat with special honour. And the parts that are unpresentable are treated with special modesty, 24 while our presentable parts need no special treatment. But God has combined the members of the body and has given greater honour to the parts that lacked it, 25 so that there should be no division in the body, but that its parts should have equal concern for each other. 26 If one part suffers, every part suffers with it; if one part is honoured, every part rejoices with it. 27 Now you are the body of Christ, and each one of you is a part of it. 28 And in the church God has appointed first of all apostles, second prophets, third teachers, then workers of miracles, also those having gifts of healing, those able to help others, those with gifts of administration, and those speaking in different kinds of tongues. 29 Are all apostles? Are all prophets? Are all teachers? Do all work miracles? 30 Do all have gifts of healing? Do all speak in tongues? Do all interpret? 31 But (you) eagerly desire the greater gifts. And now I will show you the most excellent way. NOTE: We must, when reading Paul’s letter to the Corinthian church, remember that it is a LETTER. Paul was writing for many different purposes, but mainly in this letter to encourage, instruct and correct the church in Corinth, because it was not living the Christian life in a way that was honouring to the LORD or a healthy witness in the world. Sometimes we take chunks of this letter and read them in isolation, however it’s important to bear in mind the whole thrust of the letter. 1 Corinthians 12 is linked to chaper 11 and 13 and 14 and 15… So we need to just glance back (if we’ve read it before) or READ it ALL (if you’ve never read it at all). of operating in the GIFTS OF THE HOLY SPIRIT IS (1 Corinthians 13). At the end of chapter 12 Paul tells the Corinthian Christians, “You are seeking the greatest gifts (prophesy, healing, miracles etc), but now I’m going to show you the most excellent way, then he proceeds to write chapter 13. We’d do well to remember that LOVE is the most excellent gift of all. But we also NEED every other gift to build up a strong church. 13 until we all reach unity in the faith and in the knowledge of the Son of God and become mature, attaining to the whole measure of the fulness of Christ. God’s Holy Spirit GIFTS are given to build you up into Christ’s body. BE MATURE: = A mature Christian, follows the teachings of Jesus and realises that to stand any test or storm they need to be fully relying upon the Lord. FULLNESS: Heading towards the fullness of Christ (becoming more Christ like every day of our Spiritual lives). 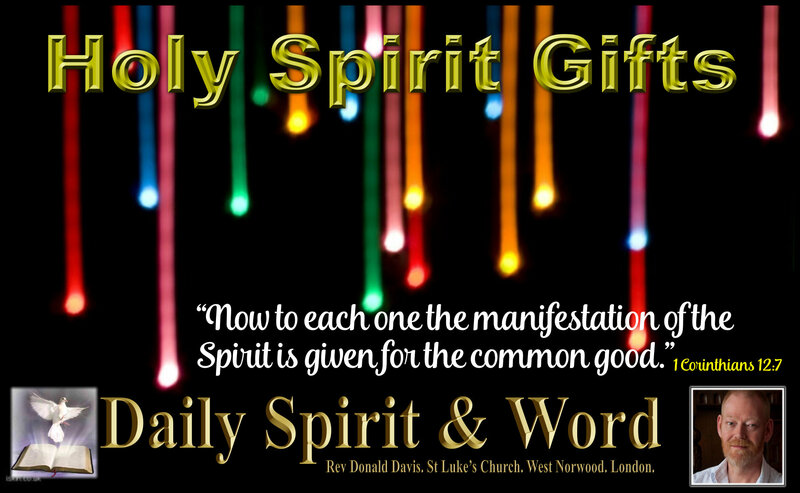 A Spiritual Gift: Is a special supernatural ability, which is given by the Holy Spirit to every believer at their conversion, to be used to minister to others, and therefore extend and deepen the ministry of the Lord Jesus Christ on earth. However, there are some things that are of vital importance to know about your special Holy Spirit gifts. In Church yesterday, we gave everyone time to read the Bible and fill in the blanks. Then we talked through the answers. NOTE: What do you think about the following statement? For many in church today, they’ll do a course or follow a series of teachings on the ‘Spiritual Gifts’, some will go as far as discovering what their own gifts are, but few, very few, followers of Jesus today will take the opportunity to use their gifts. Some churches don’t even encourage their members to exercise their gifts, so the church doesn’t grow strong ‘Spiritually’ and therefore doesn’t progress towards the fullness of Christ. I said yesterday, holding a piece of paper with their blanks filled in, “wave your paper like this” demonstrating how we get a fire going by fanning the flames, then I explained; “We all need to fan the gifts of the Holy Spirit into a blazing fire that will burn brightly for everyone to see and glorify God”. Your light, your gifts, the manifestation of the Holy Spirit, are given to you; to show, to be and to demonstrate the Spirit to the world, they will build-up His Church and will lead many to praise God. So my commitment to the LORD and to His Church is that I’m going to use the gifts that the Lord has given to me, to fan into flame my own gifts and to exercise them, so that others in the church will be built-up and encouraged to fan their own gifts into flame too. I want to see our church full of folks on fire to serve Jesus with their lives, and in turn be used by Him, Spirit ignited, to see others brought into the Kingdom. I shared about a prayer triplet that I’m in with two other men in the church. How we meet-up with one another to pray, read the bible, praise the Lord, hold each other accountable, share about our lives, and contact one another almost every day. I encouraged others: “Do you know two others, brothers or sisters, that you could get together with during the week? This is on-top of or as well as your weekly fellowship group.” I explained, “This is getting smaller to grow bigger. Much smaller, and soon we’ll all be much bigger or better and stronger in the Lord”. Let’s form hundreds of prayer triplets to ensure every Christian is a growing Christian. When you’re on your own, Satan can easily stop you, when you are two it’s a bit more difficult, but as the Bible tells us, “A Cord of Three is not easily broken”. Are you going to get into smaller groups to grow stronger for Jesus? Have and awesome week, stick close to Jesus and be filled afresh with God’s Holy Spirit today. P.S. We’re on a journey of Discovery: Practical Ministry is a wonderful way of discovering your own Spiritual Gifts. The Holy Spirit has gifted you and I encourage you to get involved, you’ll discover your gifts along the way. I.E. When you pray and lay hands on people for healing, you’ll very quickly discover if the Holy Spirit has given you the gifts of Healing. Have you made the wonderful discovery of: The Spirit Filled Life? Daily Spirit & Word, 512: Beware The Comparison Trap. 40 Days With Jesus: Day 28. John 21:18-23. Thank you for your prayers; last night’s meeting of the PCC was wonderful. There were some new members so I got everyone to introduce themselves; tell who they are, where they come from and how long they’ve worshiped in St Luke’s Church. We had a lady who’s new to the Church who wanted to ask questions about everything. It’s amazing, I’d forgotten what it’s like to be NEW in an organisation; there’s just so much we don’t know and it’s a very steep learning curve. We’ve got some wonderful blue / purple cornflowers and forget-me-nots in the garden in Springtime, they are stunning, but as they fade, the aquilegia (ladies bonnets) takes over and begins to put a different kind of delicate dance in the wind, they are beautiful, but in a very different way. Each has it’s own glory and unique beauty. So have each and every one of you. You are ALL different and God’s got very different plans for your walk with Him than for anyone else; so beware of the comparison trap. Do you remember what it was like when you first began reading God’s Word? My first thought was, “What a BIG book, it will take me years to learn to get to grips with this.” Indeed it has and to be honest, though I read the Bible every single day and have done for over 30 years now, I’m constantly surprised by what the LORD shows me. When I read a familiar old passage, one I’ve read hundreds of times, I’ll see something new, some new light is shed upon the glorious holy phrases. God’s Word is always fresh. Today, the Lord has done it again with Peter. “WHAT ABOUT HIM?”: Beware The Comparison TRAP? I’ve read this particular passage many times, preached upon it a few times, read countless commentaries about it, but it’s only when the Lord seems to highlight something within it the TRUTHS PENETRATE MY HEART, it sinks in and seeps through into every fiber of my being. When God does this through His Word, the result is a transformed life. It’ll be the same for you my friends. A man or woman can write about God’s Word or share about their experience of walking with Jesus, but until we begin to read and walk ourselves, it’s all going to be second-hand. We must not fall into the trap of merely taking what others have said and staying with that, we must seek the LORD for ourselves and for the unique calling and gifts that He’s expecting us to use in our own walk with Him. When we do, we’re going to be used by the Lord to encourage others on their own journey with Jesus. Peter had just been recommissioned by Jesus, but then almost immediately, after having had his interview with Jesus, wants Jesus to deal with the other disciples; “WHAT ABOUT HIM?” It’s like turning around and pointing the finger at someone else. Jesus rebuke is quite wonderful. “Peter, YOU must follow Me” You’ve got your own calling and destiny. I’ve got plans for you Peter. And Jesus has got plans for you too my friends. So don’t fall into the trap of just hearing Jesus and not doing what He’s calling you to do. Stop looking around at other people and expecting them to do and be the ones. 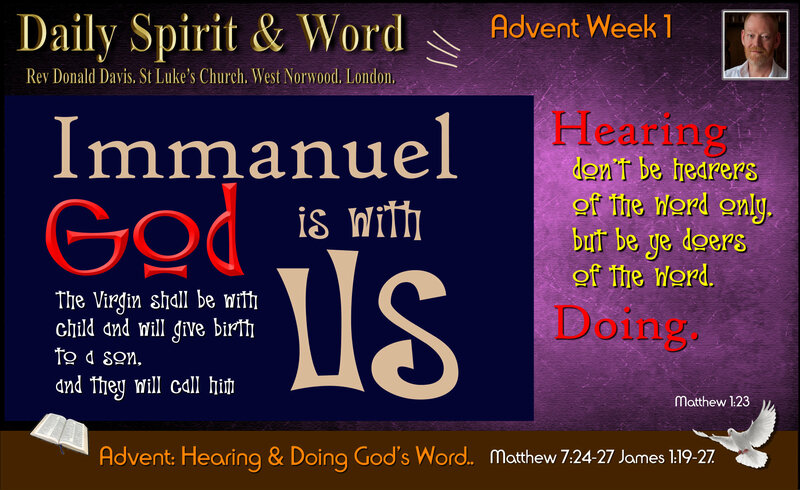 God has said in so many different ways in His Word: “Don’t merely listen to the word, but do what it says”. James 1:19-25 19 My dear brothers, take note of this: Everyone should be quick to listen, slow to speak and slow to become angry, 20 for man’s anger does not bring about the righteous life that God desires. God wants to BLESS you in ALL that you do. However, look again and you’ll see that to be blessed, we must do both, we must LISTEN and ACT upon what we’re learning. Peter almost slipped; he’d just listened to Jesus and learned a valuable lesson about being recommissioned and forgiven, then almost immediately he points the finger at someone else. To be someone who’s constantly drinking in information, and not doing anything with what you are learning; is like a barrel of fine wine with a crack, the wine inside can be of the finest vintage, but if it’s leaking out all over the place, who’s ever going to taste it? God’s Word is the finest wine in His Kingdom that you can ever get into your heart, however, If we don’t do what God has revealed, we’re going to dry up or get clogged up with information overload. It’s only when you act upon what you’ve been learning, hearing and being taught by the Lord, that you’ll get a true understanding of all that He wants you to be and to do. Thankfully, Peter learned his lesson from Jesus that day. He stopped looking at others and began to live the life Jesus had called him to in the power of the Holy Spirit. He did indeed die a wonderful martyrs death being crucified. However, tradition had it that Peter was crucified upside down, because he didn’t feel worthy to be crucified in exactly the same way as Jesus. I don’t know if that part is true, but we do know that Peter was led with outstretched hands to death for Jesus and His Kingdom. That was after a lifetime of serving Jesus so powerfully. Don’t BE a Sponge Type of Christian: Only soaking-up Information. I’ve know people in some great teaching churches, they love to hear the Gospel’s and the Word of God being expounded. Then they’ll go home and listen to some more great teaching on the internet. They’ll buy the CDs or Tapes and even Download hours of sermons. Some will even makes some notes. Then they’ll move onto the next sermon series, the next great teaching, the next fantastic, wonderfully gifted preacher, expounding God’s Word, but they’ll never get around to actually APPLYING what they’re hearing and learning. There’s a danger that we’ll become like the people of Athens in Paul’s time, who just wanted to hear the latest teachings. It’s like people who’ve got to be listening to the latest news 24/7… My friends, at some point in our walk with Jesus, we’ve got to get out and begin to DO what He’s gifted us for. Christ didn’t call you to be a knowledge sponge, soaking up great teaching, He called you to serve HIM with all your heart, mind, will and strength. Serving the Lord means doing, it means, acting, it means getting out into the world and using your unique gifts and talents to lead others to faith and trust in the Saviour as your first order of priority. Then, you’re calling also means serving Him in your gatherings, but let’s not pretend that’s all He’s called us to. So many Christians and whole gatherings of the saints settle for just serving Jesus once a week for an hour. I’ve known some Christians who get exhausted doing just that very little bit of service, as if they’ve been working at it all week. It makes me laugh sometimes when I hear people moaning how exhausted with the service they’ve become. For goodness sake, it’s ONLY AN HOUR or TWO once a week. We gather only once or twice a week, what about the other five days? We’re called to be active in His kingdom not for an hour on a Sunday, but for every waking hour. We’re God’s Ambassadors and an Ambassador is never off duty; He’s being constantly monitored by his host country. Even in the embassy, they’ll be watching, and waiting and looking for him to slip-up or to see if he’s really serving his government with all his heart. Like Peter, You are an Ambassador for Jesus Christ in this world, so you need to act like one and let others see the light and experience the goodness of you’re LORD’S Kingdom. To do that, you’ve got to be ready to serve. Yes, you do need the gatherings of the saints to be equipped, you do need to hear great teaching, you do need to get equipped to serve, but at some point, and I would say the sooner the better, you’ve got to begin to use what He’s given you. Get out and get on with what the Lord has graciously poured into your life. You’ve got the goodness of the wine of the Kingdom within you, now it’s time to let the world taste the best vintage of all. Let them savour the wine of the Kingdom through your life. Stop looking at others and saying; “LORD, WHAT ABOUT HIM?” or “LORD, WHAT ABOUT HER?” Jesus has got His own plans for you my friends, and with the indwelling of the Holy Spirit, you’ll be of great use in His Kingdom. Be His Ambassador today. You’ve got the goodness of the wine of the Kingdom within you, now it’s time to let the world taste the best vintage of all; serve Jesus today. I don’t want any of you to fall into the traps of comparing yourself with anyone else or of hearing Jesus Word and not doing it. You’ve got the goodness of the wine of the Kingdom within you, now it’s time to let the world taste the best vintage of all; serve Jesus today. 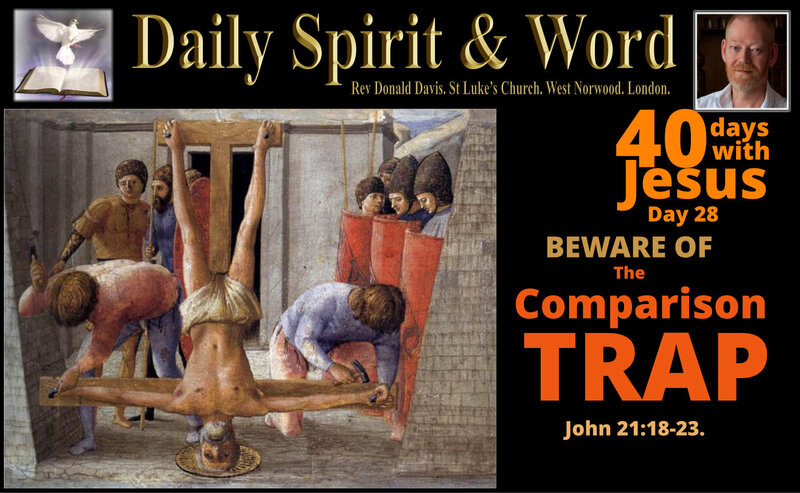 40 Days With Jesus; Day 28: Beware The Comparison Trap.